Us Brit’s love a good ski and snowboard holiday and many off us take the self-drive route, heading on an Epic Road Trip to the beloved European Alps to get ourselves and our gear there ASAP. This sounds like a good idea until your stuck on the mountain, in a random dear farm, at 3am, digging your beached hatchback out with your hands in saturated and now ice cold (useless) gloves, in the pitch black because your Sat Nav sent you up a Col that closes and turns into a ski piste every winter (Yep, true story! I was young and dumb, please don’t judge me… too much!). There were so many things I learn’t that fateful morning in Alpe d’Huez, other than how to explain to a rather angry and confused French farmer that I was in fact not here to steal his prized deer, using only the medium of mime. I learnt it’s best to know how or to have practised putting your snow chains on your car before having to do it in the dark, freezing cold with the pelting snow and blustering wind making reading the instruction leaflet rather difficult in the dim camera light of my phone. I also made myself take an oath that I would never drive in winter again without a warm and more importantly waterproof pair of gloves in the car. If you take anything from this article make sure it is that! It also occurred to me how awesome and handy a shovel would have been at that moment in time. From the day I got back home there was a set of essential equipment that never left my car. 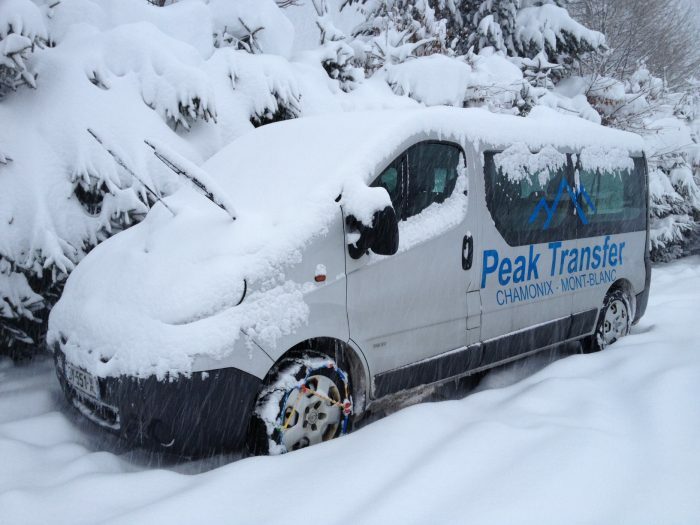 Myself, and the Peak Transfer have put together our essential winter driving equipment checklist, car winter preparation guide and a few winter driving tips homed after many years of winter mountain driving experience which we hope will help. As a bare minimum you should have plenty of tread on your tyres and ensure that they are at the correct pressures before setting off. Also check that the tyres are actually rated for the winter and are not just summer slicks. For those of you that regularly experience snow or icy conditions may want to consider the use of ‘winter tyres’. Although not a common thing in the UK (except perhaps northern Scotland) most European countries require their registered cars to switch to winter tyres before November each year by law. You find most of those living in the Alps will have a summer and winter set of tyres to switch between. Something to consider when trying to follow a local up a windy snowy alpine pass, they probably have snow tyres and 4-wheel drive! For more information and reviews on the latest winter tyres for sale take a look at Auto Express’ Winter 2015 Tyre Test. It’s illegal all over Europe to have a broken light, on the continent its even illegal not to have a spare bulb replacement set in your car! So if you don’t have a bulb set yet its advisable to purchase one and leave it somewhere accessible like the glove locker. Ensure before you set off that all snow and dirt are cleared from all lights including the parking lights and indicators. For those that have an older car, or an older battery be aware that colder weather conditions work a car battery harder than perhaps what its normally used to. Ensure its fully charged if this is a potential problem area for you (i.e. your car doesn’t like starting in the cold mornings). To protect your car radiator or even worse prevent the engine block cracking from the freezing mountain temperatures add anti-freeze to the cooling system. Also add 100% concentrated screen wash that are designed to cope with the lower temperatures you will be experiencing in the mountains. I always use 100% concentration of a solution that caters for -20 degrees, but refer to your cars manual and the recommendations made by the anti-freeze and screen wash manufactures regarding concentrations needed. Make sure that you are more than covered fuel-wise for the journey ahead and if possible try not to run low before filling up…. No Petrol Station Bingo!!! Not only is it illegal to run out of fuel on the motorway in most European counties, in the unfortunate situation that you get caught short in a major traffic jam the last thing you want is it be stranded in the middle of nowhere undoubtably in a freezing cold snow storm. Make sure break pad and discs are fully functional as icy and wet roads lead to increased stopping distances, so a healthy set of brake pads is vital for the winter months. make sure you lift your windscreen wipers before any notable snowfall, I just get myself into the habit of doing at at the end of a shift regardless. Not only will this save you time and numb fingers trying to separate the icy bond between your car wipers and windscreen wipers (I know we have all been there!) but will drastically extend the life of the wiper blade rubber making it less likely to crack. Also, if your one of those people that has a habit of just switching the engine off at the ignition before turning your windscreen wipers completely off (unfortunately I am one of these people) then it stops the risk of you damaging the wipers themselves, wiper motor or motor linkage in the morning when you turn your engine and they try to shift the many kg’s on snow acquired on your windscreen. BEWARE: In countries such as Austria you are not allowed to have your car running for more than 30-seconds before drive away! This means that you cannot defrost your car by switching it on and leaving the heater to do all the work, you have the unenviable task of doing this by hand with a scrapper and broom. You can imagine how fun this is with a 17-seater mini-bus! Whilst talking about clearing your vehicle of snow, one of the biggest and most preventable cause of accidents I see (despite it being illegal), Is when motorists fail to clear their cars of snow properly. It is not just your responsibility to scrap enough snow and ice off your windscreen so that you can peak out of it. You need to be seen also, which means completely clearing your car of snow, ensuring all lights are snow and dirt free. I often see vehicles damaged by or having to swerve on the motorway due to almost 100kgs of ice and snow peeling off the roof of the car in front at 60-70mph. In an ideal scenario you will have covered (and heated) parking available at your accommodation/ destination. For those that do not have that luxury then it may be worth considering a relatively inexpensive car cover. Why? I hear you ask, well simply to protect your car from the dramas that come from ice accumulation and it makes it much easier to get all the accumulated snow off your car in 2 seconds flat. Windscreen scraper – bigger the better I say! A fully charged torch – I also keep a head-torch in my bag, perfect for keeping the hands free whilst fitting snow chains in the dark. Warm clothing – WARM WATERPROOF GLOVES, warm hat, down jacket, ski jacket/ shell, in case you have any adventures on the mountain and need to fit snow chains/ dig the car out of a snow bank/ push your car off an icy parking spot, or all of the above! In really icy conditions I consider taking studied shoe covers for additional grip when moving around the vehicle. Driving in compromising conditions, particularly icy/ snowy ones normally just requires common sense and caution. All literature on winter driving feels you to reduce your speed to match the present road conditions. One of the biggest lessons I have learnt, which has been my best asset as a Transfer Driver is to allow more than enough time to prepare your vehicle and get to your destination. In addition to leaving more than enough distance between yourself and the proceeding vehicle. For more detailed information and tips for Driving in the snow including the 10 winter driving myths busted then check out the Auto Express website. I hope we haven’t scared any of you out of driving to the Alps, but helped make the journey a much more pleasant and less eventful experience. Enjoy your Ski & Snowboarding holiday in the Alps and hopefully we will catch you on the slopes this season!